Has a hidden magnetic secure closure. 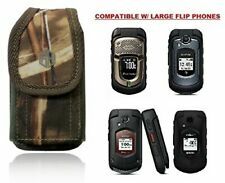 Premium rugged canvas vertical case is made of high quality canvas with a great and stylish looking with soft interior. Stylish design with soft inner lining provides excellent protection from nicks, dirt and scratches. Stylish design with soft inner lining provides excellent protection from nicks, dirt and scratches. Note: This is a universal case, the fit may vary. This is a universal flip phone case, the fit may vary. 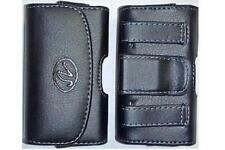 This pouch holster carrying case cover is made of premium materials. The pouch holster is equipped with built In 360 rotating belt clip for better security and front magnetic closure to ensure the safety of your phone. We decided it would be a good idea to list it for this use also. Can be used with clip only (you don't have to loop belt thru). They close with a magnetic closure for a secure fit. If you're tired of breaking plastic holsters this product is for you. Inside of case is made of material that will not scratch your insulin pump! Insulin pump not included. Keep it attached to your pocket, belt, or purse! Velcro Closure. Wear sideways on your belt and always have it at your reach! Has magnetic flap to stay closed. Hello pumpers.This is a neoprene pump pouch and belt.It's for your use in all aspects of your pumping life. If you don't like this belt for ANY REASON!! This pouch is heavy duty and can be washed with mild soap and water.It is also WATER RESISTANT ! Hello pumpers.This is a neoprene pump pouch and belt.It's for your use in all aspects of your pumping life. If you don't like this belt for ANY REASON!! Protect your pump!!!! This pouch is heavy duty and can be washed with mild soap and water.It is also WATER RESISTANT ! Insulin pump pouch/case with belt loop. Gently used.Works with most pumps. This holster is nothing short of AMAZING! Strong Rugged Simple and very effective! RuggedQX has evolved in both styling and durability, building on long-standing industry success of indestructible design. Velcro closure. Item Weight: 3.04 ounces. SNK Premium Pouch Case. THIS POUCH CLOSES THROUGH A MAGNET, WHICH GIVES IT A BETTER FEEL. NICE CLASSIC PROFESSIONAL LOOKING DESIGN. Product Features. 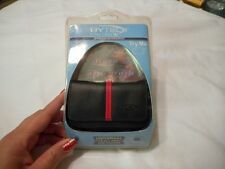 Insulin pump bag/travel case (black). Photos are of the actual bag we will send. Really good condition, clean. Mini Bag and Key Clip : It is good secure to storage your Cash Credit cards and so on. The key clip can hold your keys safe. Stay in place and non-bounce. For Samsung Galaxy Note 8 7. For iPhone 8Plus, RX,RS, MAX. Velcro closure. Need your item fast?. Velcro closure. Item Weight: 2.08 ounces.